350 mm across and 350mm deep, centre of pit 400mm deep. Excellent soil retention in pit. The Novel double flange is patented, unique and extremely rigid and reliable. With Volvo EC 55B Pro figures vary from 2.8 lphr to 3.2 lphr. 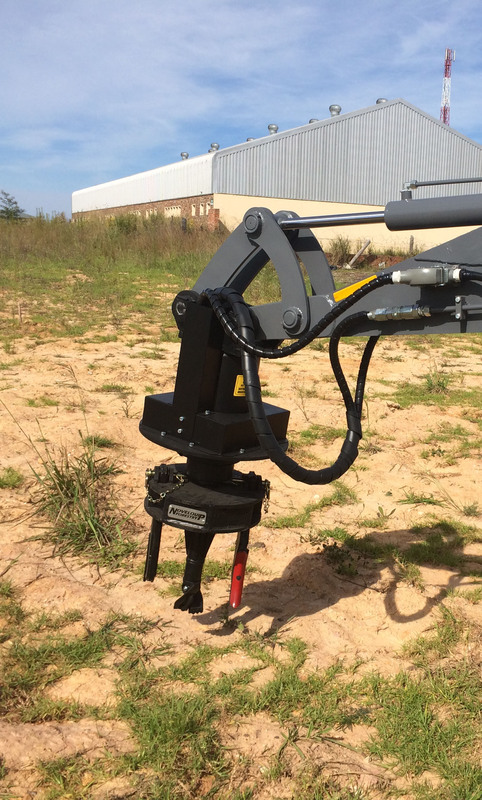 Our premium pitting head – this is the future of forestry. Hundred percent accuracy and quality without requiring marking and supervision. This machine operation requires very low levels of supervision as the quality and precision of the operation is continuously electronically controlled. Full (PLC) electronic quality and quantity control of the operation. Sends data e-mails to designated addresses, GPS every standing position of the carrier (enabling site mapping), informs the operator on completion of every pit – hence optimised productivity, and a GPS grid system with 38mm accuracy for mapping pit locations. We recommend the Volvo EC55B Pro excavator or similar as the optimum carrier. Warrantee: 1000hrs on motor, gearbox and electronic systems. This is the well-known NOVEL Multipit head fitted to more than 30 pitting machines in the South African forestry industry. Full (PLC) electronic quality and quantity control of the operation. Sends data e-mails to designated addresses, GPS every standing position of the carrier (enabling site mapping). Informs the operator on completion of every pit, hence optimised productivity. Warrantee: 1000hrs on motor, gearbox, DF (Double Flange) and Electronics. 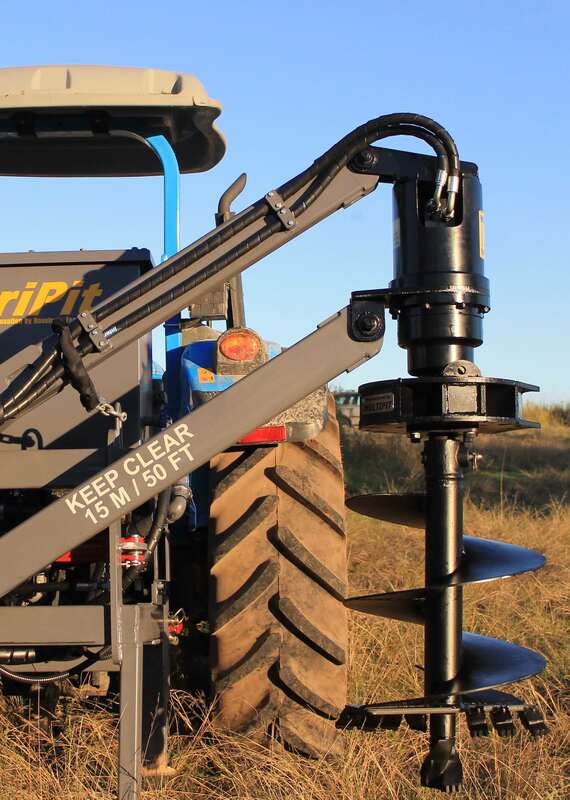 Gearbox, double flange, centre auger and tines, protection to motor and gearbox, and mechanical pit counter to record production (decreased supervision required). Warrantee: 1000hrs on motor, gearbox and DF. Gearbox, double flange, centre auger and tines, protection to motor and gearbox. This option is strongly recommended above MULTIPIT One. Base model: Gearbox, double flange, centre auger and tines. This is a straight forward budget pitting head (no shock protection). Warrantee: 250hrs on motor and gearbox. 1000hrs on DF. 200 mm to 600 mm across and up to 1200mm deep. Auger removes soil from pit. Dependant on pit size and soil type. Post holes, organic fertilizer application. Fuel consumption 2.8 to 3 l/hr. The standard bucket can be attached in a few minutes. The Multipit pitting head can be fitted back in a few minutes. Average of 2500 pps (pits per shift) overall (including transport time), single head. Twin head average 4000pps. Single-head up to 3500 pits per shift (burnt compartments). Twin-head up to 6000ppd. Tractor can be used for towing purposes and other carriers for original intent by removing heads unit. Other characteristics dependent on Carrier. The correct selection of carrier will enhance environmental friendliness. Four-head pitting machines are available as a special product. The range was discontinued due to the South African policy of inter-stump pitting (No inter-row pitting). PLC, fully automated machine, operator ONLY responsible to steer machine. Process: Align machine, activate – four pitting heads start simultaneously, but work independently until all four pits completed, heads back to home position, machine engage forward and stop at appropriate place for next pitting sequence. The process is revolving until deactivated. 120 lpm at 160 to 250 Bar pressure. PTO pump. The Novel double flanges are patented, unique and extremely rigid and reliable. Dependant on carrier type and output. 30 lpm at 160 to 250 Bar pressure. The NOVEL ProPlant machines are machines that Pit, Fertilize, Plant, Firm up and Gel / Water the seedling in a single operation. It is a precision machine dedicated to plantation establishment. Quality of every activity is electronically controlled and a single operator is required. The precision of the operation ensures precision of investment and hence an optimized return to the land owner. ProPlant machines are machines with up to 8 heads per machine catering for an espacement of 3m or 3.5m between the rows and 2m, 2.5m, 3m or 3.5m within the row. High productivity ensures cost effectiveness and precision ensures optimum yield per hectare. A ProPlant was successfully developed and tested during 2015 and Novelquip Forestry is in the process of commercializing the ProPlant machines. Planting cycles of between 17- and 22 seconds translates into 7680 seedlings planted per 8-hour shift (assuming a 30 second cycle) for an 8 head machine. Ground level sensors determine the completion of the pit and the quality of the planting. After planting of seedling the seedling is firmed up and fertilizer pushed into the soil. The NOVEL Carrier is designed and ratified by an ECSA Engineer and manufactured in-house to be a versatile carrier, but also specifically suitable and designed as an automatic planting machine for forestry seedlings. 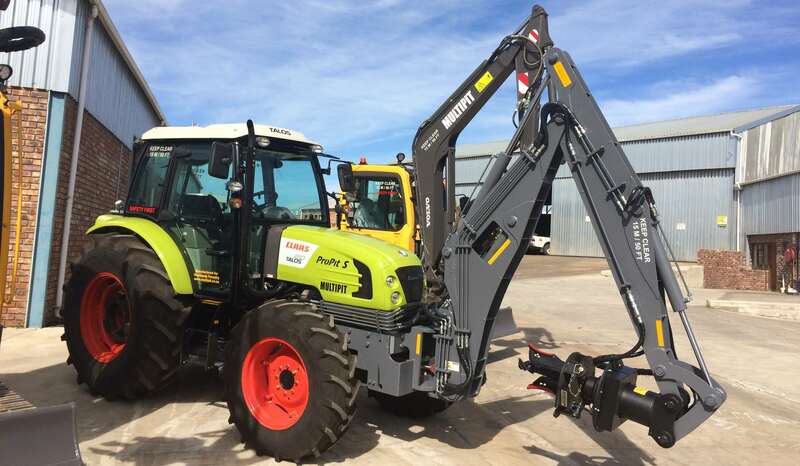 These vehicles are 4X4, 4WS, Crab-steer with an overall length of 6.2m and 8.2m respectively with an overall width of 2.4m and a ground clearance of 450mm. The carry capacity of the T12 is 12 tons and that of the T20 is 20 tons. Deutz-Weichai engines of 95kw and 199kw are used. These rough terrain vehicles are used for bulk water, spray booms, secondary watering of seedlings, carriers for equipment or silviculture accessories. Two models are available; a 12 ton and a 20 ton. All year round utilization is a reality. Trailers designed for the specific purpose and use of a customer such as the transportation of specific equipment like the Novel MPAT. Dedicated wet-ends are manufactured according to customer specifications. All valves are pneumatic-electronic controlled from the Cab, crew-cab or the rear of the vehicle for ease of operation. The water canon is remote controlled from the vehicle cab. The Slope-watch is an electronic device installed in any vehicle to warn the operator regarding the slope on which the equipment is used. The limits are pre-determined and entered into the CPU. A blinking green light indicates functionality and that the Slope-watch is “on”. When 75% of allowable slope is reached, either up / down or side-slope, an amber LED will light up and an intermittent busser will be activated. If the operator proceeds to exceeding the set limit, a red LED will light up and the situation recorded for time of and duration of the infringement. A 4 second alarm will also be set off for the warning of the operator. The record of infringements will be stored on the on-board memory and shown on the HMI (screen) of the Slope-watch. The stored information can be downloaded and printed for the records of the owner of the equipment. Novelquip Forestry was registered in 2007 and comprise The Industrial Development Corporation (IDC) of SA and the Steenkamp family as shareholders. COPYRIGHT © Novelquip Forestry (Pty) Ltd.